Goldie Hill (born Angolda Voncile Hill on January 11, 1933) was one of the first women in country music to reach the #1 spot with her 1953 hit I Let The Stars Get In My Eyes. Born in Karnes City, Texas, southeast of San Antonio, she was the sister of singer and songwriter Tommy Hill. After Tommy and his brother Ken achieved a measure of success in Shreveport and east Texas, Goldie joined them on the Louisiana Hayride and was dubbed the Golden Hillbilly. She signed with Decca, and recorded an answer disc to Don't Let The Stars Get In Your Eyes, titled I Let The Stars Get In My Eyes. Overnight, she became one of country music's heavy hitters, and scored another duet hit with Justin Tubb on Looking Back To See and Sure Fire Kisses. Soon after this song was taped, she married Carl Smith, and quickly retired to their horse farm to raise their children. 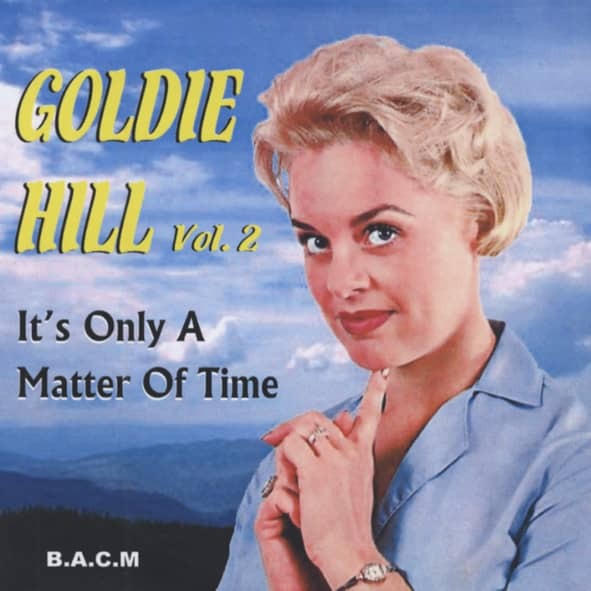 She made a short-lived comeback in the late 1960s on Epic Records under the name Goldie Hill Smith before returning to the farm. In the 1970s, following Smith's retirement, they showed horses professionally. On February 11, 2005, Goldie Hill died from complications of cancer. She was 72 years old. Customer evaluation for "It's Only A Matter of Time"